The Model 1-ST measures strength and polarity of magnetic fields up to 19,999.9 gauss. The sensor can easily fit in a .060 inch (1.5 mm) gap and is at the end of a 100 cm flexible cable. The sensor end can be bent if required for a variety of situations. Place the sensor on a magnet face to measure the field. 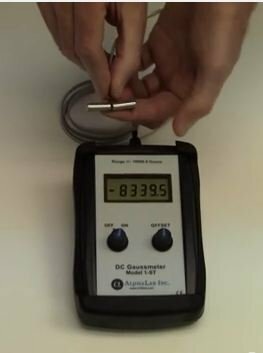 With a resolution of 0.1 gauss, it can measure any tiny variation from magnet to magnet or it can detect if a given magnet has lost even a little strength. Bend the sensor in to a “L” to measure inside a DC solenoid tube. The 5 ½ digit display requires neither auto nor manual range change, making it easier to use than older style 3 ½ or 4 ½ digit meters. Turn on the meter and immediately begin reading fields (updates 4 times per second). 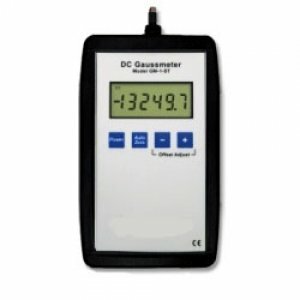 There is no setup required, making this the fastest, easiest gaussmeter available. 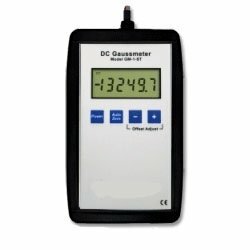 High dynamic range 5 ½ digit display reads even the strongest magnets with .1 gauss resolution, including polarity. Turns on instantly, updates four times a second, no setup or initial calibration required. Offset range is the full +/- 19,999.99 gauss. 1% accuracy at room temperature, including probe. Optional rubber boot and hard carrying case are available.